Dirty Dozen Brass Band at the Glass House Bar in New Orleans. Photo © Historic New Orleans Collection. The Dirty Dozen Brass Band was formed in 1977 when four members of the Fairview Baptist Church Band – Gregory Davis (trumpet), brothers Kirk (sousaphone) and Charles Joseph (trombone), Kevin Harris (saxophone) – joined forces with Benny Jones (snare drum), Efrem Townes (trumpet/vocals), Roger Lewis (baritone saxophone), and Jenell Marshall (bass drum). The Dirty Dozen started out playing traditional tunes but they quickly earned a reputation for incorporating melodic ideas from bebop into the horn arrangements, while the rhythm section imported rhythms from funk and increased the tempos from their predecessors. These innovations are captured in tunes like “Blackbird Special.” Kirk Joseph’s driving, repetitive tuba line pushes the song forward, and provides a melodic and rhythmic framework for the frontline instruments. Watch the Dirty Dozen play the Charlie Parker tune “Bongo Beep” live at the Glass House bar in 1982, filmed by Alan Lomax. The Dirty Dozen was also instrumental in moving brass bands off the street and onto the stage, initially at the Glass House Glass House bar in Central City, and ultimately in venues around the world. No other band has been more successful in popularizing brass band music for diverse audiences, and the band spawned a legion of followers, including the Rebirth Brass Band, who took over the Dozen’s weekly gig at the Glass House in the 1980s. 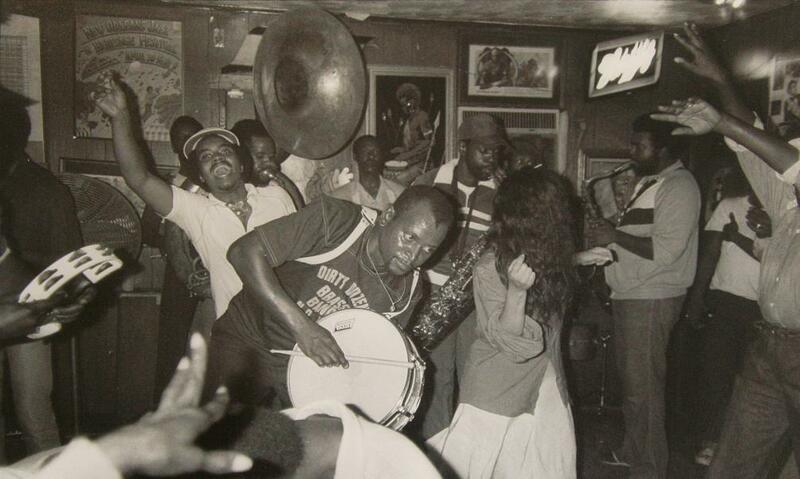 Benny Jones left the band soon after the recording of their first record, My Feet Can’t Fail Me Now, in 1983, and formed the Treme Brass Band in the early 1990s. Read a short profile of the Dirty Dozen I wrote for Louisiana Cultural Vistas.